Yet another of Bernie Sanders rallies was interrupted by Black Lives Matter protesters. Like most white liberals I have mixed feelings. This is a a thing that I will honestly admit. Personally, I’m not a Bernie supporter. I mean, if he wins the Democratic nomination I’ll vote for him in the general; I’ll even campaign for him in the general election, but not yet. In any case, this most recent interruption in Seattle is the third of which I am aware. There was Netroots Nation, some thing in a park, and now a 15,000 person rally in Seattle. It is fair to point out that I am a Hillary Clinton supporter, although I did recently take a quiz designed to see which candidate you are most highly aligned with and I scored higher on Bernie Sanders than Hillary Clinton. So it’s not that I don’t agree with Bernie on nearly every issue, I do. That said, I think that the disruptions of Bernie Sanders rallies by the #BlackLivesMatter movement deserve some serious analytical thought rather than a knee jerk “but he was part of the Civil Rights movement” memery. 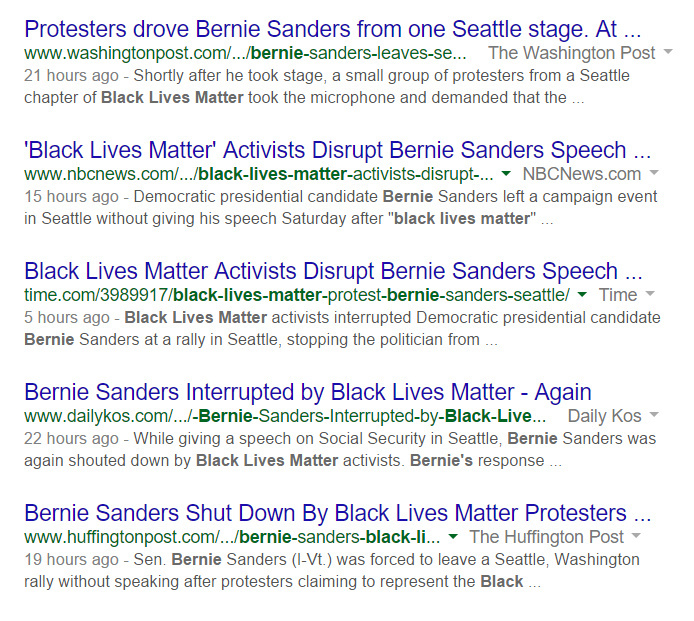 Now, to say that #BlackLivesMatter disrupted or interrupted Bernie Sanders is absolutely a legitimate headline. That happened. Protesters did not drive Bernie from the stage. It was a sizable stage, there was plenty of room. They also didn’t “shut down” the rally by any stretch of the imagination since the rally continued once they accomplished their goal. So thank you to NBC News, Time, and Daily Kos for using more accurately descriptive language in your headlines. Using hyperbolic language does not help a conversation, although it certainly does drive clicks. Let’s all remember that. In any case, back to the meme. Speaking of hyperbolic language, if you honestly and truly think that Bernie Sanders is the “only candidate willing to help” people of color I think you’re engaging in selective memory at best. Remember the Clinton administration, when Bill was President? I do. I pretty specifically remember him being referred to as our first black President. Isn’t that crazy? That’s how impossible having an actual black President felt. In any case, the Clintons have had strong ties with the black community for decades at this point and it’s not without reason, even if the relationship hasn’t always been perfect (I’m looking at you, 1994 crime bill). This is not even to mention Martin O’Malley who, after having been prompted at the Netroots Nation rally at the same time as Bernie Sanders, has begun to put together a structural racism policy platform. Hillary Clinton’s campaign has recently reached out to #BlackLivesMatter specifically. To say that only Bernie can help the black community is hyperbolic – again – at best. 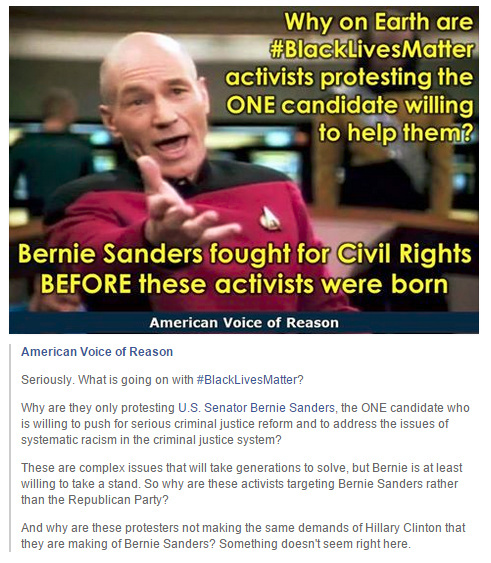 And yes, Bernie Sanders did fight for civil rights. In fact he has continued to fight for the oppressed over the course of his career. It’s not been highly covered in the media, but he’s done it. Here are a few examples. That’s fantastic, but it is inarguable that Bernie Sanders’ biggest, most all-encompassing platform is income inequality. And no, income inequality and structural racism are not always the same thing. What I would suggest that #BlackLivesMatters is trying to push Bernie Sanders on is to talk about structural racism separately from income inequality and to understand that even if you solved income inequality tomorrow we would still have race issues to work on. And I think that’s probably the best description of Bernie Sanders I’ve ever heard. As a woman, I see the problem with thinking that fixing our economic issues will solve all our problems because Marxists had the same problem. They thought that solving the economic issues would eliminate gender inequality. What they didn’t address is that gender inequality doesn’t just exist in the workplace, it exists in the home as well. These things certainly intertwine, but you can’t solve both by addressing just one. That – incidentally – is one of the significant differences between Marxism and socialism, in case anyone ever asks. I digress. We should move down to the meme-creator’s commentary below the meme. Once again, I take issue with the idea that Bernie Sanders is the only candidate willing to push for serious criminal justice reform. Jamelle Bouie wrote a great piece both praising and critiquing Hillary Clinton’s late April speech about criminal justice reform. Martin O’Malley has also chimed in on criminal justice reform. Has that been the crown jewel of either candidate’s platforms? No. Clearly, however, Bernie Sanders is not the only candidate to touch on this issue. Bernie Sanders has a longer record on criminal justice because he’s been in Congress since 1991. In terms of asking why aren’t #BlackLivesMatter protesting Republicans… I would imagine because it would be more productive to yell at a wall. Let’s move on. Above everything else in this meme-message thing, however, what most makes me cringe/eyeroll most is the “Something doesn’t seem right here.” No. Something isn’t right, otherwise #BlackLivesMatter wouldn’t need to exist. There isn’t a sinister plot to stop Bernie Sanders from becoming President. People being critical of your chosen candidate aren’t conspiring to bring about their downfall, they are offering critique that is – certainly in this case – necessary. Not only is it necessary, but apparently it’s sinking in because Bernie Sanders is actually making an effort to talk about structural racism. What #BlackLivesMatter seem to be doing is pushing him outside his talking about an economics-only view of income inequality bubble, and that’s probably ultimately a good thing. Bernie Sanders cannot win with white progressives alone. He has to expand and that means acknowledging that the problems of economically disadvantaged people of color are rooted just as much in the “people of color” half of that equation as the “economically disadvantaged” half, if not more so. If Bernie Sanders can take the heat, so should his supporters. It’s safe to say that not everyone addresses their primary policy issues in the same way, but I don’t know that any one way is necessarily the best. Disapprove of the methodology if you want, but disrupting Bernie’s speeches seems to have yielded results, even if the means “disappointed” him. I would also add that the specific addition of a racial justice platform to Bernie’s website is important even if it only underlines the ways that his other policies address racial justice. Having Bernie Sanders’ campaign make racial justice a policy platform is important in a larger way than just Bernie Sanders thinking about it. It’s important because it signals to Bernie’s many white progressive supporters that racial justice is a separate issue that needs to be thought of as intersecting with, but not being entirely subsumed into economic and criminal justice. Ultimately, we should remember that Bernie Sanders is neither magic nor without room for improvement. Whether or not you agree with the drastic measures, it’s important for a candidate whose claim to fame is working for the common person that he recognizes that not all the common people have the same problems in the same ways.